Take entirely shareable party pics with Woodland Creatures - Birthday Party or Baby Shower Selfie Photo Booth Picture Frame & Props. Each party photo prop kit is printed on heavy-duty plastic and can be reused for many celebrations. Coordinate an captivating photo backdrop for your party guests to pose in front of, then get in on the fun as they take photos with these cut out picture frames. Your party pics will be great for immediately sharing on social sites but they will also be cherished memories long after the celebration is over. 5-Piece Photo Booth Frame and Props Kit INCLUDES 1 Woodland Creatures photo booth picture frame prop, 2 round photo booth props and 2 rectangle photo booth props - Great for a baby shower or birthday party. 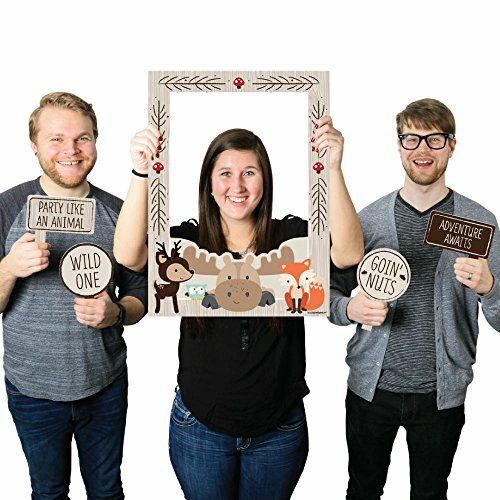 Take entertaining and shareable party photos of your friends and family while making memories with funny Woodland Creatures photo booth props! PERFECT FOR ANY CROWD! Photo booth props are fun Woodland Creatures party supplies for adults and kids - everyone will love posing with cute forest baby shower or birthday party photo booth props. Photo Frame Props Kit MEASURES 17 inches x 23 inches (Picture Frame), 6 inches x 9.5 inches, including the handle (2 Round Props) and 7 inches x 7 inches, including the handle (2 Rectangle Props). BABY SHOWER OR BIRTHDAY PARTY DECORATIONS: There are many fun ways to use these Woodland Creatures photo booth picture frame props! Style a cute photo booth with a coordinating backdrop for perfect selfies; display photo props around your event for different photo stations; or carry them from guest to guest and be sure to take cute party pics with everyone! HIGH-QUALITY PARTY SUPPLIES: Woodland Creatures baby shower and birthday party photo booth props are professionally printed on durable, corrugated plastic. They will arrive cut out and ready to use. Photo Booth Picture Frame & Props are waterproof and can be used outdoors, in any weather and at any location. MADE IN THE USA: Woodland Creatures Selfie Photo Booth Picture Frame & Props are designed and manufactured at our Wisconsin facility using materials that are Made in the USA.